Whey protein is one of the best-researched performance supplements on the market. With an array of essential amino acids and other muscle-building compounds, whey is something you might want to start adding to your smoothie recipes. 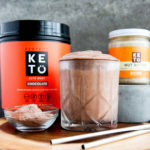 This delicious chocolate whey protein powder is especially keto-friendly, with 15 grams of whey protein isolate from grass-fed cows, 19 grams of fat, and only 3 grams of carbs per serving. With so much protein and fat, you’ll want to ditch your fruit smoothies and strawberry banana shake recipes for this blood sugar balancing whey protein smoothie. Whether you’re looking for a regular meal replacement or a post-workout shake that supports muscle growth and recovery, this chocolate nut whey smoothie is for you. Whey protein is famous for helping people maintain lean muscle mass and lose unwanted body fat. And that’s largely due to whey’s impressive amino acid profile. Whey is a complete protein, meaning it contains all the essential amino acids, plus branch chain amino acids — or BCAAs — which are largely responsible for muscle growth. Whey may help you feel more satisfied for longer, compared with carbohydrates, which can lead to weight loss[*]. And it may help improve body composition by helping you gain or maintain muscle while losing fat[*]. Nut butter, whether you’re using almond butter, macadamia butter, or a mix of several nuts, contains vitamins, minerals, and healthy fats that provide a long-lasting, low carb source of energy. Avocados also provide high-quality fats for energy, which will help fuel your workout or a long day at the office. They’re packed with monounsaturated fatty acids (MUFAs), which can help curb cravings, prevent you from overindulging and snacking, and may aid in weight management[*][*]. Even cocoa powder has been shown to support weight loss, with one study showing that chocolate consumption was linked to lower BMI[*]. Whey may also be good for your heart. It’s been studied for its effects on blood pressure, triglycerides, and insulin sensitivity, and blood sugar regulation — all with favorable results[*][*][*][*]. Diets high in monounsaturated fats from almonds and avocados may also help with heart health by lowering bad cholesterol and triglycerides, and increasing good cholesterol[*][*]. Because of its abundance of antioxidants, flavanols, and other powerful nutrients, cocoa may have the ability to improve blood flow, regulate cholesterol and blood sugar levels[*][*][*][*][*][*][*]. Nutrients from whey protein, nut butter, and avocados may also improve brain health. Your brain needs amino acids to boost neurotransmitter production, which increases mental capacity and cognitive function. Rodent studies have shown that supplementing your tryptophan levels with alpha-lactalbumin in whey protein may help improve serotonin levels and, as a result, improve your cognitive function[*][*]. Cocoa is rich in polyphenols, flavanols, and antioxidants that all contribute to better brain function[*][*][*][*][*][*]. Avocados are also loaded with nutrients that may improve brain health. Their oleic acid content supports brain and memory while their monounsaturated fatty acids (MUFA), aka the good fats, have been shown to reduce symptoms of depression and anxiety[*]. Most protein shake recipes contain inflammatory peanut butter or high-carb plain greek yogurt. Ditch all of that for this low-carb, high-fat shake that uses chocolate protein powder, nut butter or almond butter, and avocado, but tastes just like a peanut butter protein shake. This recipe is quick and simple, using ingredients you probably already have in your pantry. Feel free to add some high-quality nuts, chia seeds, flax seeds, or hemp seeds to your breakfast shake for even more nutrient density. Or, swap chocolate whey protein for vanilla whey protein powder and vanilla almond milk for a lighter, brighter taste. You can even prep your breakfast smoothie the night before, for an easy grab and go treat in the morning. Either way, you couldn’t ask for a simpler recipe to support your low-carb diet. Add everything to a high-speed blender, blending until well-combined. top with a dollop of coconut cream and a dash of ground cinnamon if desired.